WARNING: THE HUNGER GAMES and CATCHING FIRE spoilers. Against all odds, Katniss Everdeen has survived the Hunger Games twice. But now that she’s made it out of the bloody arena alive, she’s still not safe. The Capitol is angry. The Capitol wants revenge. Who do they think should pay for the unrest? Katniss. And what’s worse, President Snow has made it clear that no one else is safe either. Not Katniss’s family, not her friends, not the people of District 12. You know you’ve read a good book, when 24 hours after finishing it, you’re still thinking about it (a lot), and debating with yourself if it was the right ending. Katniss has to become the face of the revolution, something she’s not keen on, but does it with her own conditions agreed to. She’s stuck with the few survivors of District 12, in District 13, which up until the end of Catching Fire she (and we) didn’t know existed. District 13 are heading up the rebellion against the Capitol. She finds the adjustment to living there hard, even with best friend Gale by her side. Especially since her ‘’boyfriend,’’ fellow Hunger Games competitor Peeta has been kidnapped by the Capitol and through broadcasts, it’s obvious he’s being tortured. The book follows the rebels on their journey to convince other Districts to join with them to over throw the Capitol, the wars and what is a very dramatic finale. I was hooked on this from the minute I started it. Any spare moment I could find, I was reading it, and even took a lunch break this week, for 30 minutes reading, because I couldn’t stop thinking about it. I know the ending was the right one, I know it, but I was sad about it, and wanted it to end another way (this is the romance side of me!). 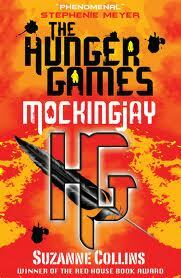 I read The Hunger Games in 2012, and Catching Fire in 2013. As soon as I read the first, I wanted to read the second, and third, but I made myself spread them out, so it wasn’t over so quickly. Now I’ve finished Mockingjay, I’m really sad. Three years of a series, and it’s over. Now I have the debate of whether to watch the films, it would keep them going, but, films are never as good as books, and do I want to tar the great place they are in my heart with less than brilliant films – but what if they’re good? The casting certainly is good – each character I’ve seen looks perfect for the part! I’ll keep thinking about that one, and for the time being, keep the series of books in a very special place in my heart!